It’s hard to let go of a “more is better” philosophy. But the problem is it spreads your time and resources too thin. It’s much better to have a sales pipeline of 10 prospects likely to close than one with 20 or 30 who might sign. 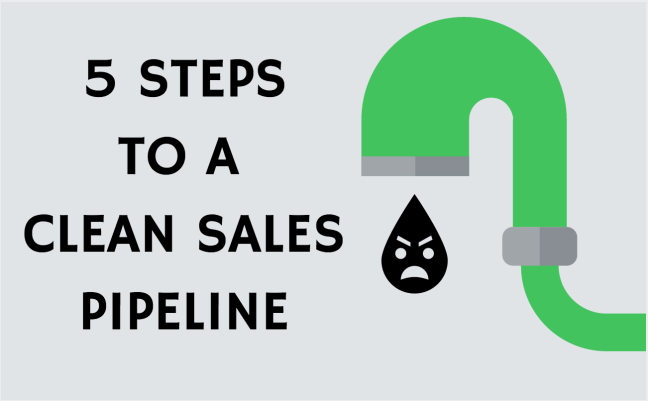 Yup, kicking prospects out of your sales pipeline will feel wrong. But no one ever failed at sales by getting more organized and focused. Good work habits and key sales activities create a steady flow of revenue. First things first — it’s time to clean up your messy pipeline and turn your sales cycle into a lean and effective operation. Go through all of the contacts in your sales pipeline once a week or so. If you find a prospect who has been clogging your pipeline up for longer than your typical sales cycle, put the prospect in a different category, such as a future pipeline or a future callback list. “As a rule of thumb, 20% of your leads are going to provide 80% of the payoff,” explains Marc Prosser, the co-founder and managing partner of Marc Waring Ventures, a firm that develops specialty Internet properties like FitBizLoans.com for high-value audiences. There are several useful ways to consider if a prospect in your pipeline needs to be removed or recategorized. First, ask yourself if a contact would be genuinely surprised at the idea of being in your pipeline. Yes? Then they should not be in it. Next, ask your prospects if it’s possible if they will make a decision this month. If the answer is no, flush ‘em. Design the categories that will work best for your sales cycle. Another great way to ensure your pipeline stays neat and pretty? Properly qualify your prospects even before adding them. Use sales management software to schedule a follow-up call or email — this part of your process can be automated. Also, a deal-rotting feature in a CRM lets you know exactly who has been wasting away in your pipeline for too long. “If someone's unresponsive, we send them an email letting them know that if they don't respond, we'll have to take their application out of our system. Sometimes, you need to put it on them to keep the relationship alive. If they won't respond, table their file and move on to the next one,” says Prosser. It’s all about maximizing your pipeline’s effectiveness at each stage. For example, if someone says that they would like your product or service, but not this month, quarter or year, it’s time to recategorize them. Only keep prospects in your active pipeline if they will close within your normal sales cycle. If you feel things have stalled with a prospect, ask more effective questions to determine how likely the prospect is to close in the near future. Cleaning up your pipeline should be like cleaning up the kitchen: It’s better to do it more or less every day instead of once a month — think of the ants! By setting up productive habits with the help of effective sales management software, you’ll stay ahead of the game. “Set aside at least 30 minutes a day to go through your CRM and recheck and backfill information from the day,” says Olivia Henkel, sales manager at Grovo, a New York-based learning technology company. “Make it a ritual,” she adds. Did I log all of my notes in the correct place? Did I log the activity in my CRM? Did I mark my next steps in my calendar so I don't forget to follow up? Are all stages and forecast category set correctly in the system? By making focused activities a habit, you’ll find your pipeline stays clean. If you need a total overhaul, start over and rebuild your sales pipeline. As you become more experienced in your industry, you’ll start to learn what steps your prospects have to move through to close. By aligning your sales cycle to common steps among prospects, your pipeline will make more sense and you’ll be able to clearly see when a prospect has stalled. A sales pipeline without movement is just a list of leads. By regularly cleaning it up, you’ll create a faster flow toward more closings. Start today. If you liked this post, check out Sales Pipeline Academy. You’ll receive 11 actionable emails to kick-start your next sales cycle and increase your close rate. Get on it!